The one dot-com sector that never crashed, that has seen double-digit growth every year for the last decade is cyber-crime. To every innovation in the last decade: social media, smartphones, online banking, there is an exploit. There is a loophole that allows hackers to steal people’s money, send spam emails or cause general destruction. This decade right now is the virus renaissance. viruses have come of age as technologically, psychologically manipulative agents of deception. In the two decades prior (2000s and 90s), viruses were still in their childlike infancy. Many were quite silly. For instance, the PolyPoster Virus of the mid-90s posted random word documents on your computer to random pages of Usenet—a popular forum. So the already crippling levels of spam on this platform on pages like alt.rec.art and alt.atheism got loaded with even more random junk like letters of approval, children’s assignments and cooking recipes. The HPS VIRUS of 1998 is named after the Hantavirus Pulmonary Syndrome (HPS)—a disease transmitted from rats that causes respiratory problems in humans. What’s even more funny (not funny) is that it mirror-imaged your screen horizontally. Can you imagine a computer virus overloading the generators on a nuclear research facility and killing people? Stuxnet is the first computer virus that can kill people. It is also remarkable for having four ‘zero-day attacks’ (loopholes in systems that are open to being exploited and hacked). A single zero-day exploit of this kind is worth hundreds of millions of dollars on the black market and that is one of the things that indicated to virus analysts that this was not just an ordinary hacking operation—that this was created by governments for some political purpose. MyDoom was the most expensive online virus of the decade, with damages estimated at $38 billion. This worm had the generic function of hijacking computers and using them to send spam and MyDoom virus-containing emails, but the scale and effectiveness was enormous. The number of spam emails sent around the world slowed global internet access by 10%. Some servers were receiving thousands of spam emails per minute. It is still the fastest spreading email ever. 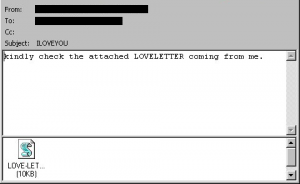 If you received an email with a ‘LOVELETTER’ attached from a mysterious person, would you think twice about opening the attachment? Or would you be knocked off your heels, flattered and eagerly open it instantly. Many people would do the second thing, as was proven in 2000 when this virus manipulated not just CPUs, but people’s own minds to spread through the world. The second trick that made this so successful was that the attached file appeared to be a .txt file. It had a .txt.vba extension, making it an executable Visual Basic script, but this file extension was hidden on Windows by default. The Love Letter originated in the Philippines. It was a generally malicious virus, causing billions in damages by scrambling random files on the victim computers. The Storm Worm is so called because one of the email messages that it was contained in was titled: “230 dead as storm batters Europe.” The worm is a trojan horse: it infects and hides in programs on the victim’s PC. It then opens the victim’s computer to be remote controlled by the attacker, which is very scary. Mostly, the attackers use it send spam emails from the victim’s computers. ‘Security through obscurity’: Apple produces their own software and hardware and keeps it under wraps. An effect is there is less exploits that can be seen by hackers. There are more Windows computers: so most hackers want to target the majority of computers. One of the most virulent things about Virus is that it preyed on unsuspecting and to a large part unprotected computers. Windows users have strong barriers against infection, but Mac users did not expect to ever need such strong virus protection.